Acoma white crape myrtle trees are small growing crape myrtle trees that grow much like a tall shrub with its top spreading growth habit. Lagerstroemia indica x faueri 'Acoma' heavy white flowering clusters in summer create such weight on the branches that it gives the plant a weeping appearance. The Acoma White Crape Myrtle Trees offer brilliant purple red fall foliage and its attractive peeling bark adds winter interest. This plant is also mildew resistant and an excellent choice for large containers or planters. This tree/shrub is also used as a hedge plant in large landscaping plantings for borders or planted in groupings to give a dramatic and eye appealing effect. 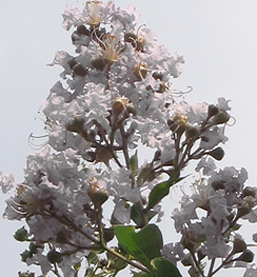 Acoma white crape myrtles are shipped as bare root plants that are in the 1.5 to 2 foot tall range.